This monograph presents a national study about how the language learning goals of college students are reflected in the Standards for Foreign Language Learning in the 21st Century (National Standards in Foreign Language Education Project, 1996, 1999, 2006). With a mixed method design, the study includes responses from 16,529 students at 11 postsecondary institutions across the United States, with interviews from 200 students at two of these institutions. The first research to examine learner perspectives with regard to the Standards, this study considers (a) whether college students have goals consistent with the Standards, (b) whether they expect to reach these goals during their formal language study, (c) whether these goals and expectations differ for first-year and second-year language students, (d) whether they differ for students of more and less commonly taught languages, (e) whether students understand the Standards and see the five goal areas as interrelated or in terms of hierarchies of priorities, and (f) how the Standards might encourage student reflection, especially regarding the relationships among language, culture, and thought. 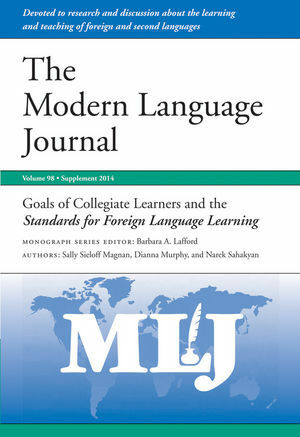 With the aim of promoting critical thinking about the Standards and their possible application at the college level, the monograph details the history of the framework, with discussion of its limited acceptance and use in postsecondary instruction, and considers what student perceptions tell us about how the Standards might fit with assumptions and characteristics of communicative language teaching and literacy-based approaches to language learning. In this discussion, the monograph examines shortcomings in the Standards framework, as seen through the lens of student perceptions. Sally Sieloff Magnan (Ph.D., Indiana University) is Professor of French, Emerita, and past Director of the Language Institute and co-Chair of the Second Language Acquisition Program at the University of Wisconsin, Madison. Her research focuses on intersections between language learning and pedagogy, from issues involving interlanguage and assessment, early in her career, to more recent work on language development during study abroad and under the influence of national efforts such as the Standards. From 1994-2007, she served as Editor of the Modern Language Journal, and as founding editor of the series Issues in Language Program Direction of the American Association of University Supervisors, Coordinators, and Directors from 1990-2006. She is also co-author of the first-year college French textbook Paroles (Wiley). In addition, edited or co-edited volumes include Mediating Discourse Online (John Benjamins, 2008) and Pedagogical Norms for Second and Foreign Language Learning (John Benjamins, 2002). Along with the Palmes académiques from the French government, she has been honored by ACTFL with the Florence Steiner Award for Leadership in Foreign Language Education, Postsecondary, by AATF with a Distinguished French Educator Award, Wisconsin Association of American Teachers of French, by WAATF with a Distinguished Foreign Language Educator Award, and by AAUSC with one of their first Meritorious Service Awards. At the University of Wisconsin, she received a Chancellor's Award for Excellence in Teaching. Her article "Enjeux et défis de l'enseignement du français langue étrangère en France et aux Etats-Unis." (French Review, 80, 2006, pp. 332–-52) received the Edouard Morot-Sir Pedagogical Prize. Dianna Murphy (Ph.D., Ohio State University) is founding Associate Director of both the Language Institute and Russian Flagship Program at the University of Wisconsin, Madison. She is also affiliated with, and currently coordinates, the UW-Madison Doctoral Program in Second Language Acquisition. A Slavic linguist by training, Murphy's current research interests are in foreign language teaching and learning, especially student and instructor perspectives on language learning, and approaches for preparing and mentoring postsecondary instructors of less commonly taught languages (LCTLs). Her recent publications have appeared in Foreign Language Annals, the Journal of the National Council of Less Commonly Taught Languages, and the Russian Language Journal. She is first author of an online foreign language teaching methods course for postsecondary instructors of LCTLs, developed with the National Council of Less Commonly Taught Languages (NCOLCTL), and available nationally through that organization. Murphy has managed projects to develop web-based lessons and online courses in Chinese, Kazakh, Russian, Swahili, and Uzbek. Among her current projects is a co-edited book on Language Flagship programs. Narek Sahakyan (M.S., University of Wisconsin, Madison) is a researcher at the WIDA Consortium, housed under the Wisconsin Center for Education Research at the University of Wisconsin, Madison. With a focused quantitative background in economics and statistics, Sahakyan’s current research interests include education policy, economics of English Language Learner education, time-series and panel data analysis, and statistical benchmarking. Sahakyan's recent publications include "Student goals: The U.S. national standards and the common European framework"(with Sally Magnan, Dianna Murphy, and Suyeon Kim, Foreign Language Annals, 2012) and "Corruption and firm performance: The case of Armenia," (with Kyle Stiegert, Journal of Eastern European Economics, 2011). Before relocating to the United States in 2005 to pursue his graduate education, Narek worked in an administrative capacity with the World Bank and the United States Agency for International Development in Armenia (2002–2005); he is also an alumnus of the Future Leaders Exchange Program (FLEX, 1996-1997).